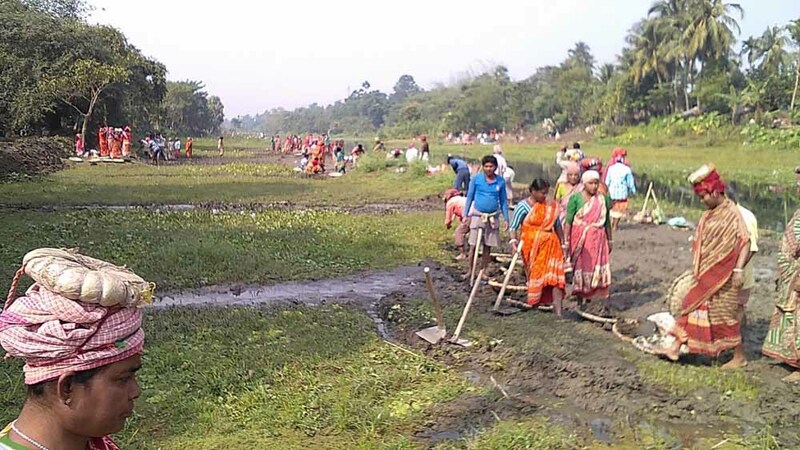 Taherpur, Dec. 8: The initiative by the Nadia administration to clear the obstructions and encroachment from the 45km dry course of of the Anjana river that flows through the district faced a jolt today as armed miscreants engaged by encroachers allegedly attacked around 50 labouers, mostly women, when they were excavating earth from a 250 ft stretch of the river course in Taherpur’s Anjangarh village illegally occupied by them. The miscreants armed with bamboo stickes, iron rods attaked the women and beaten up them unleashing terror a little after 9am when the labourers engaged by the Barasat gramp panchayat started the work of clearing earth from the bank of a pond allegedly dug up by one Krishna Biswas encroaching the river bed. 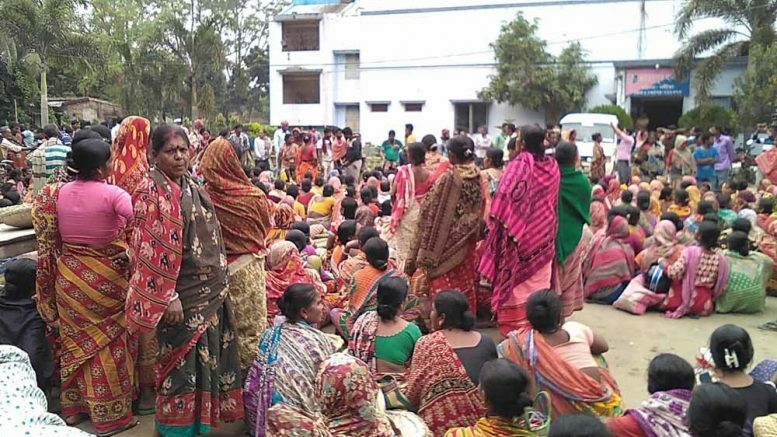 A large police contingent from Taherpur and Hanskhali police station rushed to the spot and rescued the women, who later staged a sit in demonstration demanding arrest of accused Krishna Biswas and 8 other residents who allegedly led the attack on them engaging miscreants. The sit in demonstration was withdrawn after two hours only after police officers assured to arrest the culprits. The Anjana river originated as a branch of Jalangi from Krishnanagar met Churni river in Byaspur near Ranaghat flowing about 45km through Nadia. The river, however, dried up at many places due to dumping of garbajes, encroached construction of buildings leading the adjacent areas inundated creating a flood like situation. In last year, Nadia zilla Parishad conceived a project to restore the river stream clearing obstacles as far as possible. But, from the beginning it faced protest from the encroached. Zilla Parishad chief Bani Kumar Roy said: “There may be objections, but we will try our best to ensure a free flow of the river for sake Krishnanagar and other areas for which it was once worked as lifeline”. Executive assistant of Barasat panchayat, which executed work said: “There are many encroachment. We know all of these may not be cleared so we demarcated minimum recoverable stretch when we found Krisna has dug up a pond in dry river bed. Our labourers were removing earth from its bank, when his men attacked”. Rita Biswas, a labor said: “Miscreants dragged us out of the land pulling by our hair and beaten us with bamboo poles. They also outraged our modesty. Some local residents called police who rescued us”.